$40.00 Shoulder boards of junior regimental military school student, 1940s. 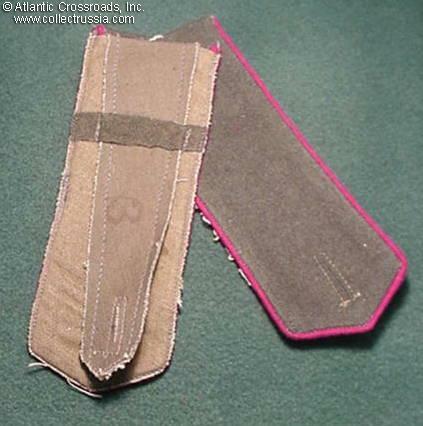 $50.00 Artillery private shoulder straps, sew-in, circa 1945. No maker stamp. $25.00 Air Force private shoulder boards, sew-in type 1940s. $3.00 Small silver rank star for junior officer shoulder boards	domed variation, with thicker arms of the star. $6.00 14mm medium gold rank star, flat version for "narrow" shoulder boards of a senior officer of non-combat service branches, 1940s-50s. $6.00 13mm gold rank star for shoulder boards of a junior officer in non-combat unit, 1940s-50s. $10.00 WW 2 era, 16mm tin button for gimnasterka shirt.